I have experimented with making my own potato-fries-type deliciousness for about a year and while it's been fun "testing", those days are done. I have finally come up with the perfect method for making absolutely tender, yet slightly crisp potato bites. It's so simple, I can see why it took me so long to narrow it down... sometimes the best things are right under our noses and we overlook them! Now, I share it with you! 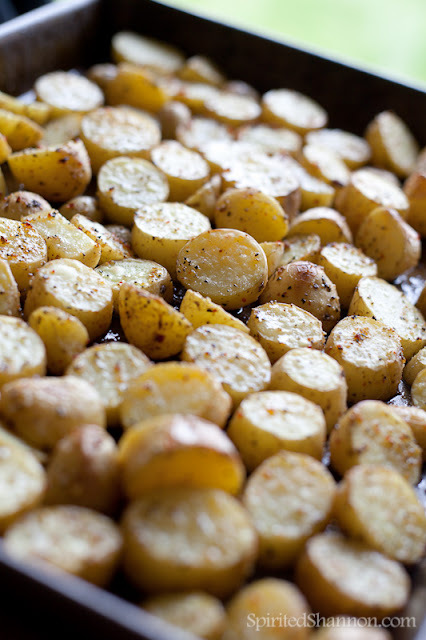 Cut up your baby potatoes into bite-sized bits. I find that cutting them into thirds is usually enough. Place your potatoes into a bowl and add enough vegetable oil to coat them, a nice "glug" should be enough - and for you technical types, about 1/4 cup-ish... roughly. Sprinkle in about 1 tsp of salt, and 2 tsp of pepper, and stir everything around with a spoon. Stir until all your wedges are coated nicely, and transfer them in a single layer to your cookie sheet. Pop the cookie sheet into the oven and bake for 30-35 minutes, depending on how thick your slices are. Once they're done with the initial bake, switch on the broiler, and move your rack up close to the broiler top. Place your cookie sheet about 6-8" from heat, and let them sizzle for 2-3 minutes or until done to desired brownness. Remove from oven and let cool for 2-5 minutes. Enjoy under curry sauce, savory gravy, or just plain ketchup! Delicious!